Teddy Roosevelt throwing Gus Nylen as C. B. Irwin looks on, Frontier Days, 1910, photo by Ralph Doubleday. Copyright G.B. Dobson, 2002. Photograph may not be reproduced or used on-line without express permission of copyright holder. As noted at the beginning of this chapter , the 1910 Frontier Day Rodeo was attended by former president Theodore Roosevelt. But that year there was, as depicted above, another Teddy Roosevelt, a horse owned by C. B. Irwin. 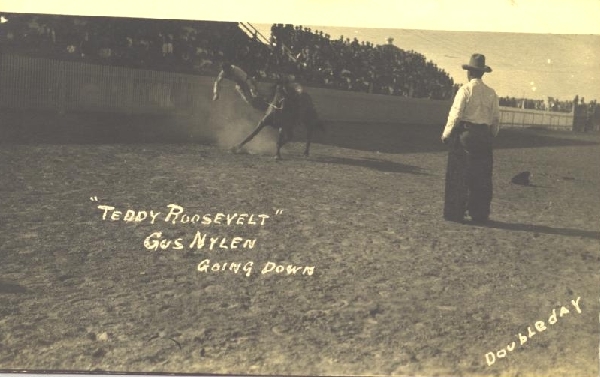 The second Teddy Roosevelt, featured in Irwin's movie, was made famous when Ralph Doubleday (1881-1958) took a photograph of the horse throwing Gus Nylen. Doubleday had previously accompanied former president Roosevelt on his African safari, but it was the action photo of Nylen that made Doubleday a famous photographer. 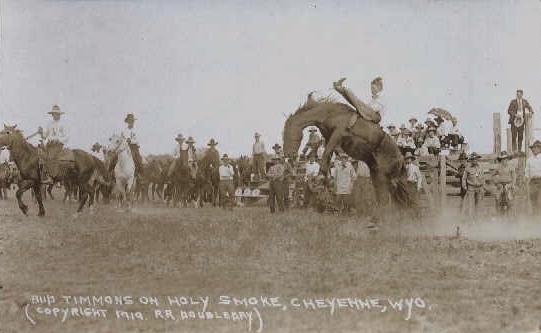 Thereafter, Doubleday made a specialty of rodeo photographs, traveling from show to show and making postcards in his hotel room, getting as many as 200 from one negative. The postcards would then be sold the next day. The caption on the postcard is in error. The horse is not Steamboat. The postcard is a colorized copy of Doubleday's photo. For discussion of H. H. Tammen see Cody. Teddy Roosevelt also threw William Wallace and previous champion Hugh Clark when he "sunfished"; that is swapped ends with rapidity causing the rider to become dizzy. H. H. Tammen is not the only postcard publisher to err in the identity of horse or rider. Compare the next four postcards. Mert Osness "Sticks Tight." Photo by A. E. Gordon, 1936. Clyde Whitey Rains "Sticks Tight." Photo by A. E Gordon, 1936. Buddy Timmons on Holy Smoke, 1919, photo by Ralph Doubleday. Buddy Timmmons on "Jack Dempsey." 1939 Curt Teich Postcard. 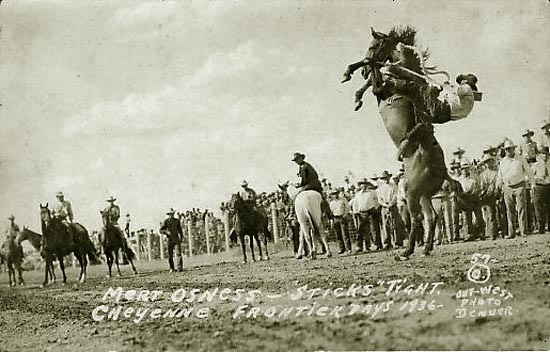 Mert C. Osness (1907-1984) along with Olav K. Osness (1900-1970) participated in Frontier Days in the 1930's. They came from near Billings. Clyde Whitey Rains (1919-1993) also came from Montana. Ralph Doubleday made a similar error with regard to the identity of the horse in the next two postcards. Was the horse Holy Smoke or was it Jack Dempsy? As indicated by the photo, Doubleday later in his career also published conventional postcards, colorized from earlier photos. Compare with photo of Timmons on Holy Smoke. Note that the name of the horse has changed. The horse, Jack Dempsey, was on the circuit in the late 1920's. Thus, the identification of the horse as being Holy Smoke should be taken as correct. While taking photographs in the arena, it would, of course, be impossbile to take notes. Thus, errors of identification were bound to creep in. Over the course of 42 years, Doubleday covered all the leading rodeos and many of the minor ones from Texas to Oregon, from Florida to Calgary. 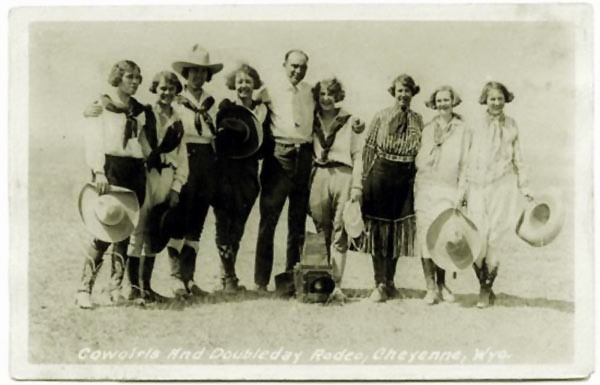 In Wyoming, he covered rodeos in Buffalo, Casper, Cheyenne, Cody, the State Fair in Douglas, Jackson, Lusk, Newcastle, Rawlins, Rock Springs, and Sheridan. Doubleday's photographs were all taken without the use of a telephoto lens. Doubleday used the same camera throughout his career, with the bellows actually being taped together. Both A. E. Gordon and Ralph Doubleday in order to take their photographs would have to get right in the arena. As indicated by the next photo, this sometimes could be dangerous. Indeed, Doubleday, as indicated by Will Rogers on his national radio program, indicated that Doubleday actually had animals leap over him. A. E. Gordon's wife only attended one rodeo with her husband. She was so terrified by her husband being in the arena, she never attended again. In 1988, in honor of his photography, Doubleday was inducted into the Rodeo Hall of Fame. Follwing his death in 1958, Doubleday was interred in an unmarked grave in Council Bluffs, Iowa. "Run for Your Life," photo by A. E. Gordon, 1929. Photographers snapping shots as rider is thrown. Ralph R. Doubleday with friends, Cheyenne, undated. As indicated by the next photo, other events just for the amusement of the audience would be presented. 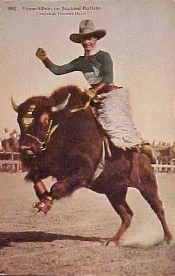 Thus, as an example C. B. Irwin in addition to being a world champion roper, owner of a Wild West Show, and stock contractor, acted as a rodeo clown in earlier shows. He also had a trained pony act which he would present as well as bucking bison. The job of the stock contractor is to provide all of the animals required of the rodeo. Since competitors are judged and events are timed, it is necessary that the animals are properly trained to buck, etc. This, in fact, required top notch stock. Additionally, smaller rodeos may not have all of the equipment required such as the chutes, etc. These will be provided by the stock contractor who, in essence, acts as the producer of the show. 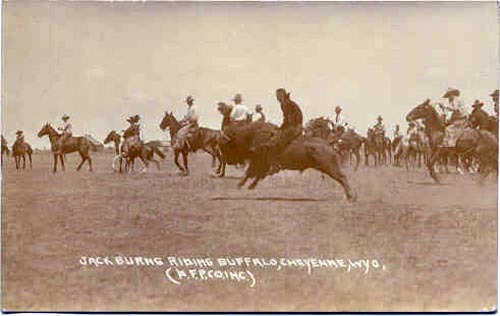 Jack Burns on Bison. Photo by Ralph Doubleday. 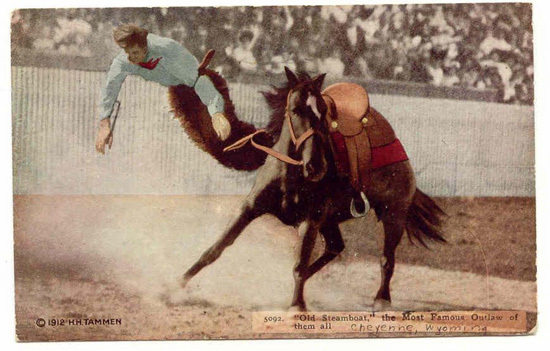 Verne Elliott (1890-1962) actively competed in rodeos from 1907 to 1910. 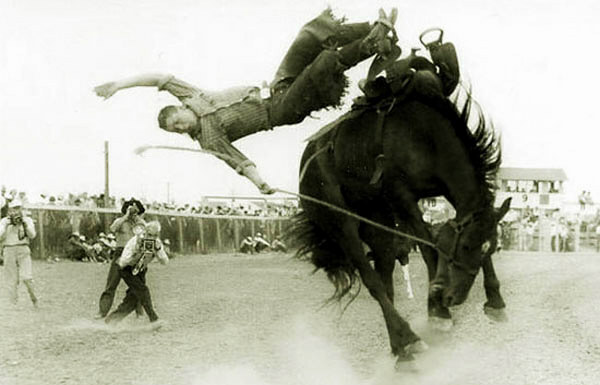 As a result of injuries received in the 1910 Rodeo, Elliott withdrew from actively participating in rodeo events, but later became a leading stock contractor. He is noted for having introduced Brahma bull riding at the Fort Worth Rodeo in 1933. Previously, the event was steer riding, far less dangerous. Following World War I, he became a partner with Eddie McCarty pictured at botton of the page. Elliott also introduced side release chutes in 1927. The Elliott-McCarty Company took rodeos to London in 1924 and 1934. Elliott was inducted into the Pro-Rodeo Hall of Fame in 1990. A bucking horse is trained just as carefully as his racing brother, is just as valuable, and not infrequently, just as much of a pet, when he's out in his box stall. Every horse has a natural resentment against being ridden, and all of them will buck the first time they are saddled and a man swings onto their backs. Some go at it in a half-hearted fashion, and become splendid saddle animals. Others are much more sincere about it -- they have the fighting heart. It is from this class that the Frontier Days buckers are chosen, and then their training begins. Expert riders, who can slide off without being injured, ride the horses and permit themselves to be thrown. On other occasions the horse is "dummied" -- that is, a dummy made from a man's clothing, stuffed with straw and sand, is placed on his back, and tied there with light string. The horse easily bucks this off. As a result of this, he grows confident that he can throw anything. Then the idea reaches him that this is what he is supposed to do, exactly as a race horse knows that he is supposed to run. From this point, the treatment of both kinds of horses is the same -- grooms, box stalls, exercise and some practice work. Good bucking horses will bring almost as good prices as racing animals. 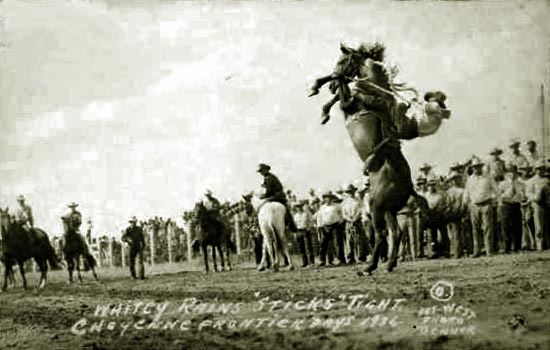 Another Frontier Days rodeo cowboy who later became a noted rodeo producer and stock contractor was Eddie McCarty (1887-1946), the winner of the 1919 Saddle Bronc Contest. Winning Ride by Eddie McCarty on "Done Gone." Artwork by G. B. Dobson based on 1919 Photo by Ralph Doubleday. 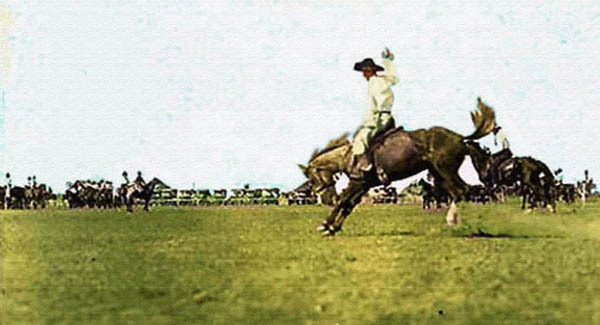 Done Gone made his initial appearance at Tex Austin's Albuguerque Rodeo in 1917. 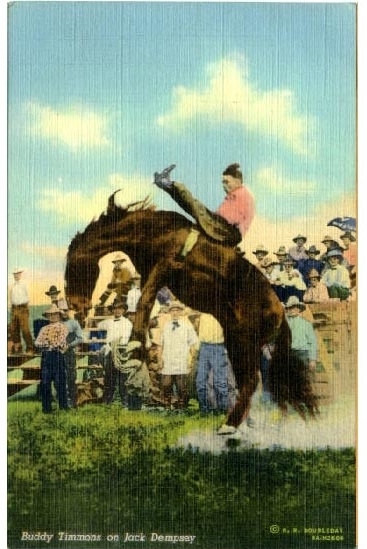 At the time, the horse was known as "Cockle Burr Dun" Since no one had ever heard of him, the entrants to the rodeo regarded him as just another so-so bucker. He threw all who tried to ride him and thus earned the name "Done Gone. McCarty eventually purchased the horse. 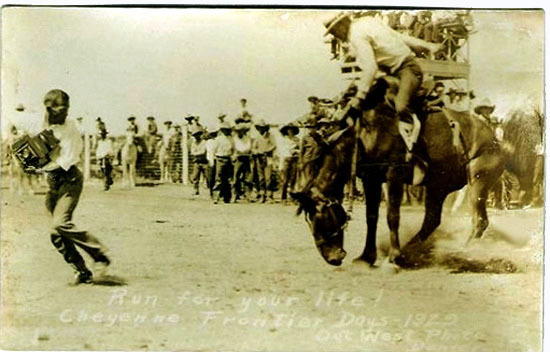 Done Gone in the 1919 Frontier Days show won the title of "hardest bucking horse." 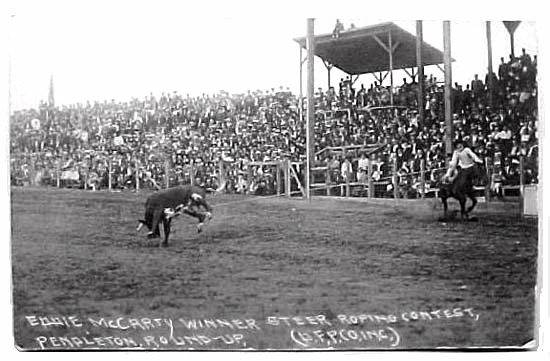 McCarty also won the 1908 Steer Roping Contest and the 1914 Steer Wrestling Contest. Additionally, as indicated by the next photo, McCarty won a steer roping contest in the Pendleton Roundup. The "DFP" initials on the photo stand for Doubleday Frontier Photo. Next page: Rodeo clowns, Red Sublett.